Yep, nothing livened up our childhoods quite like Dad's special birthday balloons, am I right? Sometimes dad's balloons didn't seem to know if they were coming or going! But the important thing to remember is that, in the end, dads' balloons always got the job done. Thanks to Kathleen, Jess, Jamie, Pontmarie, Pat S., Denise C., Kevin C., & Julie C. for the beautiful "balloons." WV: Unoniz- I fear that when the decorators "unoniz" it may be difficult to fire those responsible for these wrecks. Looks like that last embryo is going to be tetraploid. Balloons. Dad's balloons are responsible for lots of things. Even deadbeat dads seem to have given balloons at some point in time. Haha. This is an...interesting...if not highly applicable/appropriate tribute for Father's Day! ;D LOL Wreck on! Any man can be a balloon donor, but it takes someone special to be a dad. OK, I'll admit it... I was halfway through the post before the lightbulb went on. The last one had my co-workers looking at me funny because I was laughing so hard. Well done, as always. 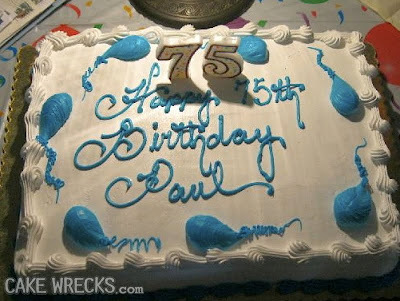 At age 75, Paul's little swimmers look like they are doing really well! That runny egg white one made me want to throw up! And I get what that last one looks like, but what was is *supposed* to be? Funny post! Not to criticize, but isn't it Flag Day? Or are you showing patriotism by not posting any more wrecked flags? Ewwww. Now I know why food service workers wear those cellophane gloves. I read on an infertility support board that if we eat that last cake, it increases your chance of getting pregnant, especially if it is pineapple flavoured including mashed-up core*. * Of course if you read any infertility support group for any length of time you will see tons of anecdotal "evidence" that [fill in this blank] really truly helps you get pregnant regardless of scientific accuracy. It's mostly bunk. But I bet you I could successfully spread a rumour that eating that cake would work if I was so inclined! I want to thank my dad for giving my mom balloons in May (anticipatory Mother's Day gift???). Re: coming or going...I think his were coming, since I arrived after the traditional waiting period. Ugh, #6! Is that what happens to icing left out for an eternity? That would make an interesting science project. Ha-ha-ha-ha! @Sharyn - applause on your safe cake comment. WV: throsub Throsub scary-looking balloons on dose cakes. I'm pretty sure balloons should be considered an advanced technique, since I've seen it take *cough* someone a year or more to be able to not make them spermy. OMGoodness... you went there. You totally went there. It was brilliant. 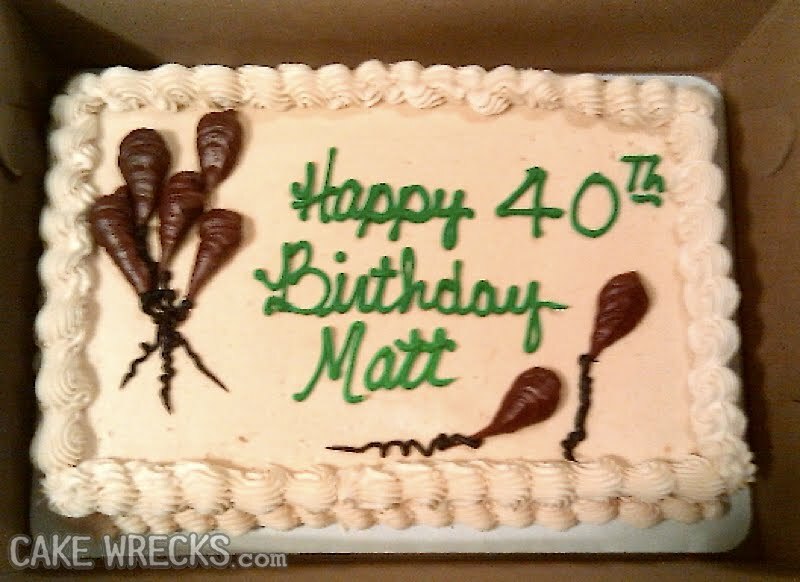 I really don't know what to say about the brown "balloons." I'm pretty sure something further could be said, but I really don't know what. I'm thinking that's a good thing. My work gives away "balloons". I think the "balloons" in cake #6 are actually pool balls. Well, if there were more of them and they were different colors and... nevermind. It's "hopeless". "Coming and going" LOLOLOLOL You slay me! What's the "WV" thing all about? Oh my, truly LOL! Or, as Dad would say, "Har har har!! *koff koff koff*"
Seriously, in a very odd way I'm thrilled that you found such a great use for all these...balloon decorations. Great job today! 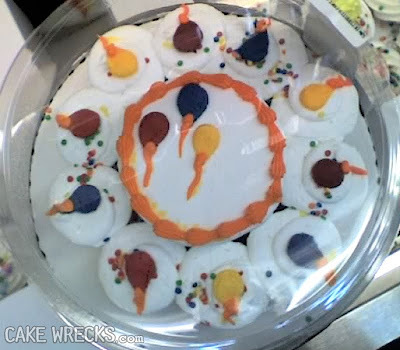 As a geneticist, I might look at that last cake as the excuse for the wreckerator - "I have too many chromosomes to decorate correctly - see!?!" Cake # 3. Costco. I can almost guaran-dam-tee it. They make yummy cakes but their icing balloons are .. not quite.. balloony! ACK! poo and sperm, poo and sperm. Honestly, when will the madness end?! Just REALLY thankful there were no white umm...BALLOONS. yeah. Jen, John, you guys are too too too hysterically funny. Congratulations, you have us all trained. Gwyndall, the wv is the Word Verification you are required to type in that blank down there in order to be allowed to comment. Sometimes they are just hilariously apropos. WV: foras. "Foras much as I like cake, I don't think I could bring myself to eat one of THOSE cakes..."
Looks like sperm whales on that 75th birthday cake! So many questions...when did poo-shaped piles of icing become decoration? Brown balloons? Really? And cupcake cakes...why? Just...why? Great post! I'm falling out of my chair laughing over here. 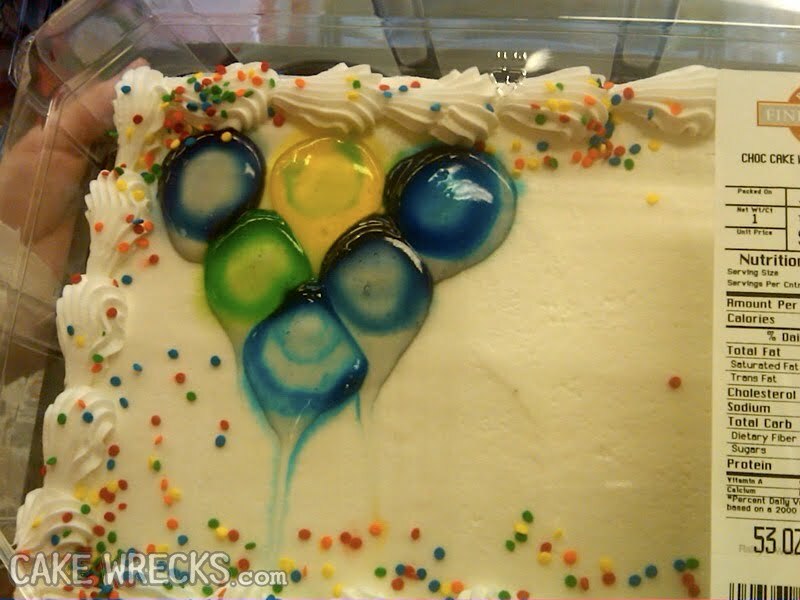 I refuse to believe that the wreckorator who made the blue "balloons" had no idea what they looked like. In fact, I imagine that he or she was giggling madly the entire time. I was worried when I saw the first cake. I thought it was for a 13-year-old dad! It happens. #4 My brain wants to know how that gelatinous effect was achieved and whether it was intentional (if intentional, WHY?). My stomach, on the other hand, is experiencing a total lack of curiosity. 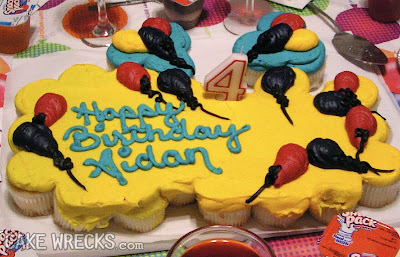 #6 Note to self: never shop at the Graphic Bakery. Some of those captions were dertio, but freakin hilarious nonetheless. Keep it up! 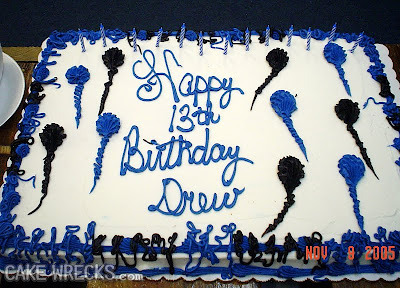 Well without dads balloons I wouldn't be here lol.. sheesh do they all have to look like deformed alien sperm? Or worse yet deformed colored poo swirls of doom? Scary and evil wreckerators lol. Never mind the cakes... you write so well :-) Keep it up. Well. MY theory is that these thingamabobbers are SUPPOSED to represent sperm. "Why? ", you say? Because they are all FOR GUYS. And what do guys like to brag about the most? Yes, their sperm counts. The topic even outranks discussions about the size of their engines, their shoe size-although that is tied in ("big shoes, big...." you know--winkwink), and the sperm cakes Mother used to make. 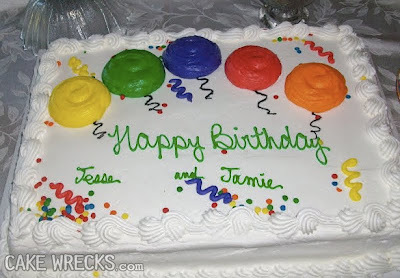 Um, seriously decorators, don't bother with balloons. 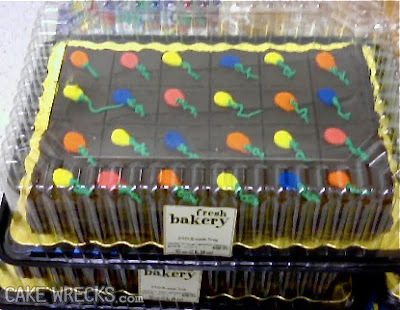 Like chocolate frosting "creations", there's just no way to get it to look anything like what you intend. Thanks to Cake Wrecks, I avoid making balloons on any cakes! I am skeered they will look like these "balloons." 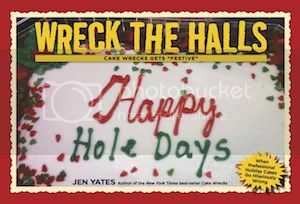 It comes to a point when people are just trying to get on Cake Wrecks. Especially the first one. That baker knew full well that looked nothing like balloons.